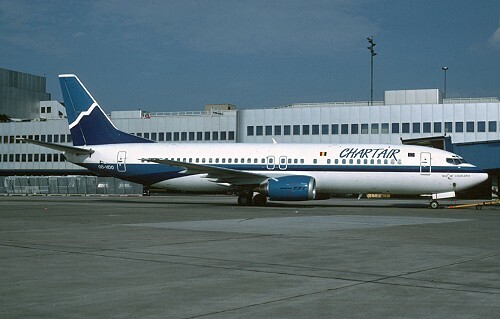 History: Chartair was formed during 1993 by Red-Air (Regional Economical Developpement by Air) with financial support from Turkish investors to provide pax charter services from Charlerloi-Gosselies, mainly to points in Turkey and Lourdes in France. The sole B737 was delivered on July 5 1993 and operations commenced the day after. Sometimes the airframe was wet leased to third parties. The aircraft was returned to the lessor on January 18 1994 and the company was declared bankrupt on January 25 1994. Red-Air remained dormant until been taken over by newly formed Brussels International Airlines on July 6 1999.